Kyrie Irving signed a max deal this week in refreshingly drama-free fashion. No fuss, no muss, just a tweet from Dan Gilbert and a video of the newly minted gazillionaire dancing in celebration. Life is good for the 22-year-old point guard, and better for Cleveland fans tired of the speculation that Irving wanted out of town. At the very least, many thought he would take more than two minutes to agree to a long-term extension. That's not the case and Irving's here for the long haul. The next step for him is to return to the leadership role he was growing into during his first two years with the franchise. Those were the "Mr. Fourth Quarter" days, when the point guard with the illest dribble in the association (Author's Note: "illest" is street slang for "nothing better than") was breaking ankles and crushing last-second jumpers in fearless fashion. That Irving was sorely missing last year. Blame Mike Brown's less-than-inspirational coaching techniques or Chris Grant trying outsmart to himself with hipster draft picks, but Irving took a step back. Too much hero ball, and too many moments when he looked disinterested on both ends of floor. There were times when Irving seemed to chafe against being on the court at the same time as Dion Waiters. And even on the days when he was pouring in points, he was often matched bucket-for-bucket by his opposite number. Ideally, Irving would not be the keystone piece of the team. Point-guard led championship squads are rare. And everyone knows you need a "Big" something-or-other to make a serious run in today's NBA. With That Guy in Miami (TGiM) and his little sewing circle adorably opting out of their contracts at the same time, it's likely any dream of a Reverse Decision has died on the vine. For the LeBron-less Cavs moving forward, a marvelous concoction of being very good and very lucky is going to have to be built through draft picks supplanted by smart trades and smarter free agency signings. Irving is now the face of this effort with Andrew Wiggins and a cast of question marks surrounding him while the Cavs try to make a splash in the summer free agency maelstrom. It's going to be interesting, and the Cavs, with Grant out and an up-tempo coach in, are in a far better position than they were at the end of last year. 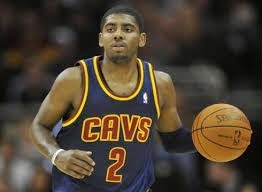 Money man Irving now serves as the point of the Cavaliers' spear, and it's time he takes that role and runs with it.